The culture of Levi Strauss & Co. is fueled by strong values, creativity and hard work. Using innovative, sustainable and progressive practices isn’t just how we make our jeans and other products, it’s a principle we value in all of our work. Innovation is at the core of what we do. From inventing the world’s first pair of blue jeans, to implementing cutting-edge design techniques, to developing new ways of working, we encourage our talented employees — and anyone who slips on a pair of our jeans — to dream big, do more and grow. Since 1873, our jeans have been an inspiration — and a symbol — for courage, fearless exploration and unwavering originality. We are honored to have clothed generations of individuals, leaders, thinkers and doers. Here at Levi Strauss & Co., we’re guided by our values: empathy, originality, integrity and courage. With them in mind, we constantly strive to build a culture just as inspiring as the people who wear our jeans. May 20, 1873 marked an historic day: the birth of the blue jean. It was on that day that Levi Strauss and Jacob Davis obtained a U.S. patent on the process of putting rivets in men’s work pants for the very first time. Levi Strauss, a Bavarian-born dry goods merchant, came to San Francisco in 1853 at the age of 24 to open a West Coast branch of his brothers’ New York wholesale dry goods business. Over the next 20 years, he built his business into a very successful operation, making a name for himself not only as a well-respected businessman, but also as a local philanthropist. One of Levi’s customers was a tailor named Jacob Davis. WE MADE OUR FIRST JEANS OUT OF DENIM – THE TRADITIONAL FABRIC FOR MEN’S WORKWEAR. WITHIN A VERY SHORT TIME, THE JEAN WAS A BONA FIDE SUCCESS. One day the wife of a local laborer asked Jacob to make a pair of pants for her husband that wouldn’t fall apart. Jacob tried to think of a way to strengthen his trousers and came up with the idea to put metal rivets at points of strain, like pocket corners and the base of the button fly. These riveted pants were an instant hit. Jacob quickly decided to take out a patent on the process, but needed a business partner to help get the project rolling. He immediately thought of Levi Strauss, from whom he had purchased the cloth to make his riveted pants. Davis wrote to Levi to suggest that the two men hold the patent together. Levi, being an astute businessman, saw the potential for this new product, and agreed to Jacob’s proposal. The two men received patent #139,121 from the U.S. Patent and Trademark Office on May 20, 1873. 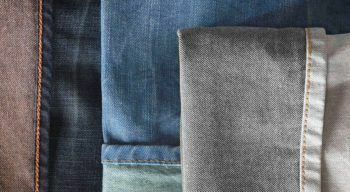 We consider May 20, 1873 the “birthday” of blue jeans, because although denim pants had been around as workwear for many years, it was the act of placing rivets in these traditional pants for the first time that created what we now call jeans. The next time you see someone wearing a pair of Levi’s® jeans, remember that these pants are a direct descendant of that first pair made back in 1873. That year, two visionary immigrants — Levi Strauss and Jacob Davis — turned denim, thread and a little metal into what has become the most popular apparel on earth. View our Levi’s collections here.